Francisco Urra Museo Nacional de Historia Natural, casilla 787, Santiago, Chile. Morphological description of Gonionota mimulina (Butler) is updated. Diagnostic characters, photographs of adult, illustrations of wing venation and male and female genitalia are provided. Aeschlimann, J.P. 1974. Élevage, biologie et complexe parasitaire de Anchinia leureolella (Lep. : Oecophorid.) en haute-engadine (Suisse). Annales de la Société Entomologique de France 10(1): 123-127. Becker, V.O. 1984. Gelechioidea. In: Heppner J. (Ed.). Atlas of Neotropical Lepidoptera Checklist: Part 1. Dr. W. Junk Publishers, The Hague, The Netherlands. pp. 27-53. Bucheli, S.R. 2009. Annotated review and discussion of phylogenetically important characters for families and subfamilies of Gelechioidea (Insecta: Lepidoptera). Zootaxa 2261: 1-22. Butler, A.G. 1883. Heterocerous Lepidoptera Collected in Chile by Thomas Edmonds. Transactions of the Entomological Society of London 1883: 49-90. Calvert, W.B. 1886. Catálogo de los lepidópteros rhopalóceros i heteroceros de Chile. Anales de la Universidad de Chile 69: 311-352. Clarke, J.F.G. 1951. The moths of the genus Coptotelia Zeller (Lepidoptera: Oecophoridae). Acta Zoologica Lilloana 11: 335-352. Clarke, J.F.G. 1964. Neotropical Microlepidoptera, III: Restriction of Gonionota melobaphes Walsingham with descriptions of new species (Lepidoptera: Oecophoridae). Proceedings of the United States National Museum 115(3480): 61-83. Clarke, J.F.G. 1968. Neotropical Microlepidoptera XVI: A new genus and two new species of Oecophoridae (Lepidoptera). Proceedings of the United States National Museum 125(3654): 1-8. Clarke, J.F.G. 1971. Neotropical Microlepidoptera XIX: Notes on and new species of Oecophoridae (Lepidoptera). Smithsonian Contributions to Zoology 95: 1-39. Clarke, J.F.G. 1978. Neotropical Microlepidoptera, XXI: New genera and species of Oecophoridae from Chile. Smithsonian Contributions to Zoology 273: 1-80. Common, I.F.B. 1990. Moths of Australia. Melbourne University Press. Victoria, Australia. 585 pp. Gaede, M. 1939. Oecophoridae II, In: Bryk, F. (Ed.) Lepidopterorum Catalogus Pars 92, W. Junks, Gravenhage. pp. 209-476. Harper, M.W. Langmaid, J.R., Emmet, A.M. 2002. Oecophoridae. In: Emmet, A.M. (Ed.) The moths and butterflies of Great Britain and Ireland, Vol. 4, Part 1: Oecophoridae - Scythrididae (excluding Gelechiidae). Harley Books Publishers, Great Horkesley, UK. pp. 43-177. Hodges, R.W. 1998. The Gelechioidea. In Kristensen, N. (Ed.). Lepidoptera, Moths and Butterflies 1. Handbuch der Zoologie/Handbook of Zoology IV/35. Walter de Gruyter, Berlin y New York. pp. 131-158. Jinbo, U., Sugisi, K., Kogi, H. 2004. Redescription and life history of Anchinia cristalis (Lepidoptera, Gelechioidea), a poorly known moth in Japan, and a historical review on the family-group placement of the genus Anchinia. Transactions of the Lepidopterological Society of Japan 55(4): 315-323. Klots, A.B. 1970. Lepidoptera pp. 115-130. In Tuxen, S. L. (Ed. ), Taxonomist’s Glossary of Genitalia in Insects, Second Edition, Munksgaard, Copenhagen, Dinamarca. 359 pp. Lee, S.M., Brown, R.L. 2006. A new method for preparing slide mounts of whole bodies of microlepidoptera. Journal of Asia-Pacific Entomology 9(3): 249-253. Leraut, P. 1992. Redèfinition de certains taxa du groupe-famille appurtenant aux Gelechioidea (Lep.). Entomologica Gallica 3: 129-138. Lvovsky, A.L. 2012. Comments on the classification and phylogeny of broad-winged moths (Lepidoptera, Oecophoridae sensu lato). Entomological Review 92, 188-205. Meyrick, E. 1922. Lepidoptera-Heterocera: Family Oecophoridae. In: Wytsman, P. (Ed.) Genera Insectorum 180, pp. 1-224. Morrone, J.J. 2001. Biogeografía de América Latina y el Caribe. M&T–Manuales & Tesis SEA, vol. 3. Zaragoza. 148 pp. Urra, F. 2014. Un nuevo género chileno de Depressariidae (Lepidoptera: Gelechioidea). Boletín del Museo Nacional de Historia Natural, Chile 63: 101-110. Urra, F. 2015a. Redescripción y nuevos registros geográficos de Doina edmondsii (Butler, 1883) (Lepidoptera: Depressariidae). 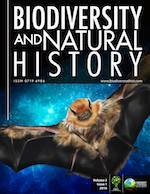 Biodiversity and Natural History 1(2): 50-54. Urra, F. 2015b. Tenoia, nuevo género de Autostichidae (Lepidoptera: Gelechioidea) de Chile central. Revista Chilena de Entomología 40: 30-36. Urra, F. A Redescription of <em>Gonionota Mimulina</Em&gt; (Butler) (Lepidoptera: Depressariidae). BNH 2016, 2, 40-45.